The Inn Town Campground's comfy glamping tents will be available for booking in March 2019. Glamping? It's on, once the Inn Town Campground tents reopen in time for warmer weather. Look to March to book one of these nature-close beauties. INN TOWN CAMPGROUND... will reopen booking for its 17 glamping tents in March 2019. That should be a spring-themed spring in many steps, but the springful feelings don't end there. 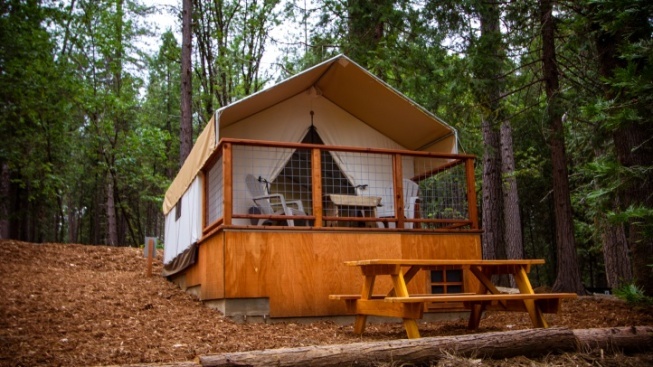 Visitors to the Nevada City campground, which includes a number of RV-ready sites that stay open throughout the year, can also expect to find "a calendar full of Instagram-worthy of events and activities," as well as happenings built specifically around holidays. And as for super-special events? There are photo walks, every quarter, which will surely get your 'gram filled up, as well as a cute Easter Egg Hunt on April 20. Crafts, table tennis, time hanging out by the fire pit, barbecuing, and other chill-out doings are frequently seen around the tree-packed Inn Town Campground property. A PROPERTY... that isn't all that far from downtown Nevada City, should you want to toodle down Broad Street for a sip or supper.